Robust, readily portable and easy to use, the HVB10 high-voltage bridge from Megger allows cable and sheath faults in power cables to be prelocated reliably and accurately, even in difficult applications. 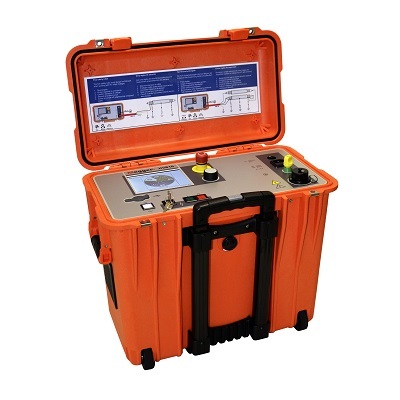 The instrument, which also has facilities for sheath fault testing and sheath fault pinpointing, is particularly suitable for use on long HV cables, and in situations where pulse-reflection methods of fault prelocation do not give satisfactory results. To provide the best possible accuracy, the HVB10 uses the bi-polar voltage drop method at voltages up to 10 kV to prelocate cable faults. This method eliminates the complicated setting up associated with conventional bridge techniques and also excludes many sources of error including, for example, voltage drop in the test leads. Bi-polar testing also means that galvanic and thermoelectric effects in the cable do not affect the test results. For maximum user convenience, two fault location modes are provided. Standard mode provides good results for typical sheath faults in around 30 seconds, while high-accuracy mode uses the full power of the instrument and its advanced algorithms to provide results for difficult high-resistance faults in around one minute. An intermittent fault detection algorithm is also applied to provide results under worst-case conditions with sparking faults. An intuitive user interface based on Megger’s EasyGo rotary knob technology complemented by a large backlit touchscreen make the HVB10 particularly easy to use. Automatic test sequences are supported, and these guide the user step by step through the correct testing procedure. Extensive safety features are also built in, which inhibit the test sequence if the cable capacitance is too high for the instrument to discharge safely, or if the test leads have been connected incorrectly. Megger’s new HVB10 high-voltage bridge is supplied in a strong durable IP54 PELI trolley case that provides dependable protection and ensures easy handling. It can be powered either from its internal battery, which can be recharged either from the mains or from a vehicle electrical supply, or direct from a standard 50/60 Hz mains supply. Optionally, the instrument can be supplied with a factory-fitted 8.44 kHz audio frequency generator to aid line tracing.